October 08 - Without a doubt this is the beginning of Autumn and what a variation we saw this month in the weather - from days sat outside in the sunshine to the first fall of snow by the end of the month and temperatures dropping to nearly zero. Such extremes in the month along with the colour changes in the leaves on the trees always makes it an exciting month. 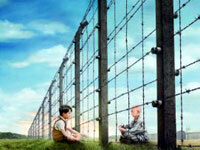 At the beginning of the month we went to see the film The Boy in the Striped Pyjamas. We both read the book some time ago and so knowing the ending didn't help with the subtlety of the story. The film was still very moving and the audience remained silent in their seats at the end stunned by the outcome. This is a harrowing story and not for the faint hearted but we must all be reminded of the capacity for man's inhumanity to man - a truth that is as strong today as it has ever been. We didn't fly in October but we did get sent an aerial photograph taken by somebody else who flew over our house. Whenever Steve flies over the house he usually doesn't have a camera to hand and in the the past the local farmer has kept ostriches so we have had to fly over at 1,000 feet. This was a lovely evening and Colin flew right over the house possibly a little too low, but a rare view of our plot. Steve has marked the boundary of the gardens to emphasise the part which belongs to us. As you will have seen from last month's update, Jane's sister Ruth had come over from Tasmania to visit their mother. Jane had a superb day in London with her sister centred on the Stampex exhibition which was in the Business Centre in Islington, which is a stones throw away from Brother Richard's house. 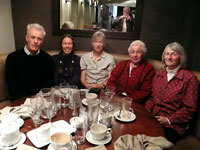 Just before she left the family had a lunch time reunion with left to right - Richard, Jane, Carol, mother and Ruth. 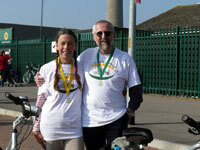 As mentioned last month we've been in training for the 25 mile Cycle4Cynthia charity cycle. For the first time it started from the Saints rugby ground at Sixfields and so we decided to cycle from home to the start. It was a chilly start to the morning with quite thick fog but by the time the event got underway just after 9 o'clock the mist was thinning and it promised to be a beautiful morning. The route took us up though Duston and through the Spencer Estate before going though Brington, Whiston, Brockhall shortly after which was the first refreshment stop. We had a quick munch on a chocolate bar and some water before heading down through Flore, Nether Heyford and on to Bugbrooke. From there we cycled on to go through Rothersthorpe, our home village and downhill to the Saints ground where this photo was taken. Including the cycle from home and back again we did a total of 33 miles. The 25 mile circuit took us 2 hours and 13 minutes and we raised over £350 for charity. 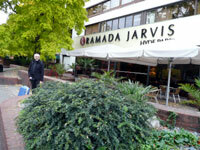 For Steve's birthday Jane booked a couple of nights in the Ramada Jarvis Hotel Hyde Park. We caught the train from Northampton station on Friday morning and got the tube over to Notting Hill for a short walk to the hotel. It was in a great location opposite Kensington Gardens so after dumping our bags we immediately went for a walk through Hyde Park. 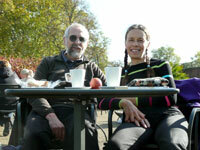 We stopped at lunchtime at the Lido next to the Serpentine, the sun was shining and it was a really beautiful day. After a quick sandwich we were off again. Normally for Steve's birthday we arrange a camp fire evening (see October 2007) but this year we decided to give it a miss as it has lost some of its freshness over time and last year many of the guests preferred to watch the rugby international in the kitchen rather than participate outside. Considering we were both born in London (Jane had lived in London until she was 18 Steve until he was 7) it surprised us both how little we knew about west London. Neither of us had been to Kensington Palace Gardens or walked around the Serpentine. 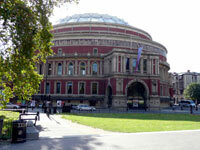 On the south side of Kensington Palace Gardens is the Royal Albert Hall, across the road from the Albert memorial. Our final visit was to the Science Museum and by this time we were getting a little tired. We had a drink in the cafe to revitalise our flagging energy but this still didn't ignite the spark that we hoped we would experience. We were both looking for that excitement we had as children on our first visit but it just wasn't the same. 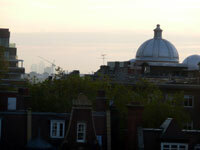 The view from our hotel window gave us a roofscape right across to Canary Wharf. Unfortunately the bedroom window didn't open so the photos we took were not as good as we hoped but we watched the sunset on Friday evening and sunrise on Saturday morning - it was really beautiful with aircraft crossing from the east on their run-in to Heathrow airport. Rather than eat in the hotel we wandered into Notting Hill and ate at The Old Swan. The first night we sat on a table with two Polish women and on the second night we were joined by two guys from Nottinghamshire who were both a little worse for wear but polite enough. Notting Hill is like any central urban area with crowds of people milling outside pubs and clubs but at no time did we feel threatened or concerned. 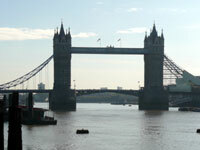 On the Saturday morning we caught a tube across town to Bank station and walked down to the Thames and along to Tower Bridge. Steve had a particular memory from when he was about 3 or 4 of his dad dangling him over the railings of the bridge with the river far below. We took the tour of the bridge with a lift taking us up the first tower before we walked across the upper walkway and took pictures across the city. We then had the opportunity to see how the bridge was operated in the days of steam. It was the highlight of the day. We walked back along the river to Tate Modern which was packed and we decided not to visit the Rothko exhibition because of the queues, also Rothko isn't a painter we appreciate. Whilst in art appreciation mode we travelled over to Tate Britain, getting out at Pimlico station and walking the short distance to the gallery only to find it required tickets to see the events and the queues were enormous so we abandoned this idea and travelled back to Leicester Square and the National Portrait Gallery. This was now mid afternoon and everywhere was extremely busy but we enjoyed a cappuccino in the cafe and a wander round the photographic event. The Sunday morning was Steve's birthday and we planned to travel to Euston, store our bags and then travel to Regent's Park to see a frieze exhibition followed by a visit to the refurbished St Pancras station. On arrival at Euston we discovered that there were engineering works on the line and we would have to get a train to Hemel Hempstead then change onto a bus to take us to Northampton. The prospect of this journey later in the day filled us with dread so we cut our plans and got on the next train. Our journey which normally would take just over an hour took over two hours and was a real downer on the day with no apologies from Network Rail or even an offer of a drink on the bus. All round very poor customer service. Despite the travel set back on the Sunday it was a great weekend.